Below are the upcoming available workshops in the GTA. Contact Niki directly at nikikingsmill@gmail.com for large groups or corporate events. Niki will share her knowledge of watercolour and help you develop your own technique and style. Please feel free to come with an idea in mind! We can work together over the course of your lesson on anything you want to acomplish. You will leave with the skills you need to continue your practice at home. Without Materials ($160): Please bring your own supplies that you enjoy using! Join me for an afternoon of painting all things Spring! We will focus on spring trees, tulips & other seasonal flowers. This short watercolour workshop will allow participants to explore traditional as well as loose and impressionistic watercolour techniques throughout a series of hands-on exercises. Both flower images and natural flowers will be used as a reference. Students will get practical tips and professional advice to better understand the possibilities of the medium. Coffee, tea, snacks & glass of wine provided! Join me for an afternoon of creating a wintery watercolour landscape. Students will learn the basic principles of watercolour while painting their own unique landscape. I've partnered up with TOAST to bring the Intro to Watercolour - Floral Painting Workshop to the Hammer! All levels are welcome, but beginners are encouraged! Come learn to paint watercolour florals through a simple but effective approach to painting that is sure to yield beautiful results. All course materials & instruction - yours to keep so you can practice at home. Have you always wanted to try your hand at watercolour but aren't sure where to start? This floral watercolour workshop is the perfect intro for beginners. Everyone can paint florals! We use a relaxed approach to painting that is sure to yield beautiful results. We will be painting from both photo references as well as a live bouquet. 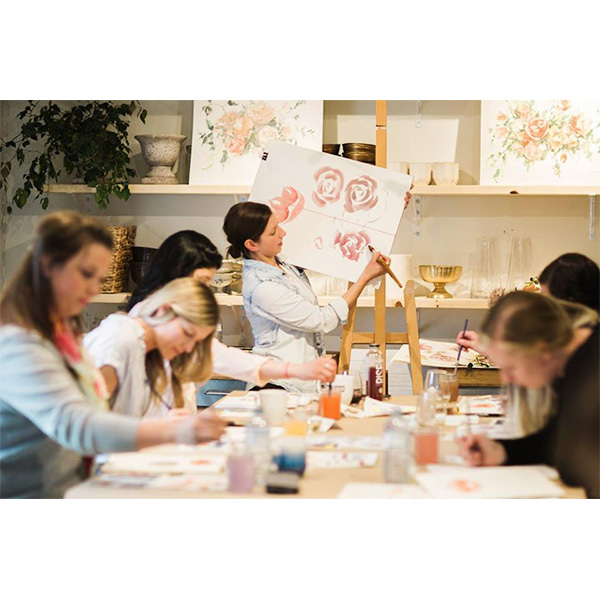 The course will cover three types of floral painting ranging from very easy to moderate. Students will leave with the skills, and materials, to continue their painting practice at home. Your price includes all materials, instruction, a glass of wine or beer, and hearty snacks.